So, Paula Deen decides to make lighter Southern food and it gets headlines? It's a campaign year, and I am sick of the mud-slinging, so I will just say this: I think the wrong person has been getting the headlines all this time. When it comes to Southern food, real Southern food that has evolved — as any cuisine should — my vote is for Bryant Terry, including his book, The Inspired Vegan. Yes, vegan. And Southern food without bacon and lard. 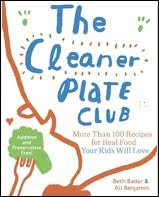 Terry's recipes use many of the classic ingredients one associates with good Southern cooking; black-eyed peas, greens, sweet potatoes, grits, johnny cakes, sweet tea, molasses. And, he definitely doesn't use factory-farmed pork or Velveeta, which is not on any seasonal, heritage ingredient list I can fathom, Southern or not. The beauty of Terry's take on Southern ingredients is that he's re-thought them, added his life influences, often Asian, and continues to create. Food, like everything else, must evolve. Terry's food is healthy. This commitment to good, healthy food is not just in his cooking, he lives it. Terry has worked for food access and food justice as well as nutrition education and empowerment throughout the span of his career. This is not a new brand image he's acquired for marketing purposes. 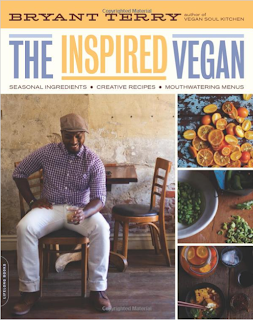 Vegan or not, and I am not a vegan, his recipes are creative, and, as the title suggests, inspired. The recipe for Savory Grits with Sauteed Broad Beans, Roasted Fennel, and Thyme is the sole reason my 7-year-old now requests "Fennel!" as a favorite vegetable when we shop. This fall, I am looking forward to trying Sweet Potato-Cornmeal Drop Biscuits with Maple Syrup. The fresh shell peas at the market right now will be great in Black-eyed Peas in Garlic Ginger Braised Mustard Greens. Terry's Pickled Red Onions are a staple condiment in our fridge for months now. Get past the "vegan" thing if you are not vegan. When I am run dry on ideas for making vegetables delicious, I turn to vegan cookbooks for inspiration. Not the ones that try to make non-meat versions of a burger or hot dog, but the ones like Terry's that embrace the flavors and richness that vegetables and grains can bring. The title is so aptly named. This is Inspired cooking. And Terry, as a chef who uses his creativity to help and inspire others, and to bring about food justice and healthy choices for all is my kind of inspiration, too.